It's been a challenging winter on the farm. We've gotten several feet of snow, a couple ice storms, and seen a few passes of the Polar Vortex which brought cold temperatures, long snow storms and wind temperatures reaching -30 F. Fortunately for us, our neighbor kindly plowed our driveway all winter long, which was really helpful when we needed to get the pig out in the middle of February to be bred at friend's farm! Fortunately for us, our neighbor has kindly plowed our driveway all winter. 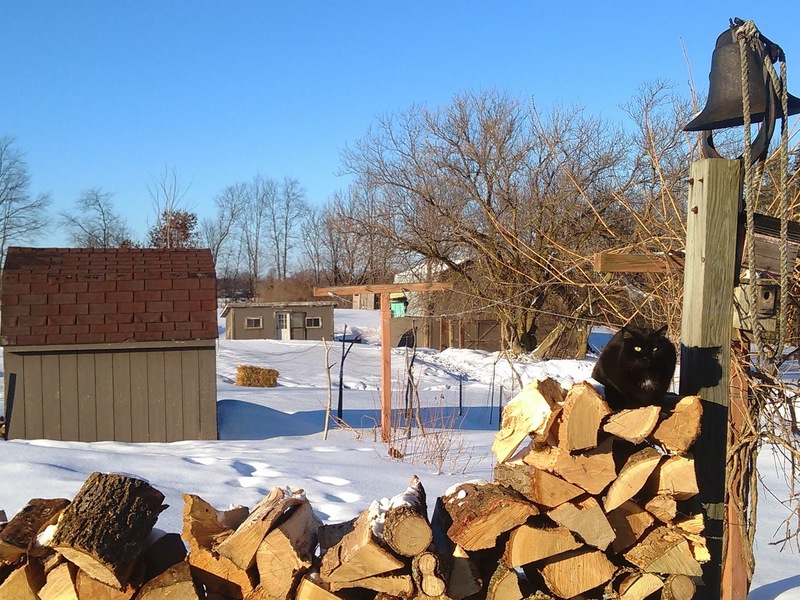 Winter on a farm is all about ensuring you have the essentials: water, food, and heat. We found that we underestimated some of these needs this winter and didn't have enough for heat for both our hungry wood burning stove and for straw for winter bedding for the animals. Luckily, we live in the country, where connections for straw bales can be found at our local hardware store or craigslist. In a 20 mile radius there are four places that sell seasoned wood, that we know of. We've been loving our new wood burning stove, we've saved so much money on propane, which was especially high this winter because there has been a shortage in Michigan. To supplement our wood supply, Farmer Don has chopped down a couple of dead pine trees in the forested part of our property, or as we refer to it, Mirkwood. Pine burns fast so it makes great kindling for getting a fire started. With all the chainsawing, wood chopping, bale throwing, and bucket slinging these farmers have gotten more than a little winter-crazed. We're all getting cabin fever waiting for spring, this time last year we had green growing grass! As for water, our waterline out to the barn is not below the frost line, so that got turned off and drained some months ago. We had wanted to redig it last year, but hadn't the time at the end of the season. So, we've been getting our water to the animals the old-fashioned way. With five gallon buckets, a lot of them. Chopping wood, hauling hay and straw, and carrying full buckets every day has made for some very in shape farmers! The farm after a two day ice storm. Try carrying buckets of water across that! 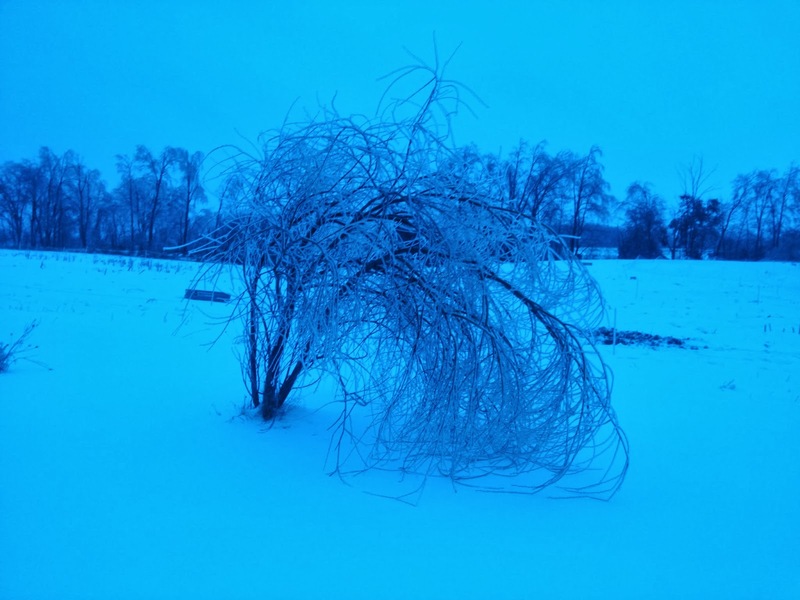 Many people in our area lost power for days or even weeks after the ice storms and polar vortexes. We have been very fortunate and have not experienced any power loss. In some ways it may have been a good thing that we didn't re-dig the irrigation to the barn for winter use. 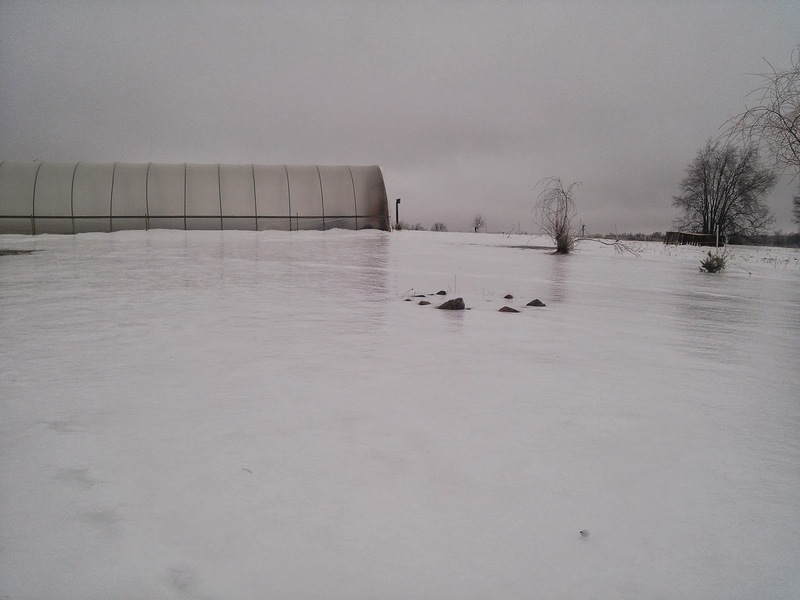 A farm we follow in NY, called Chicken Thistle Farm, had their irrigation in their barn freeze and burst, flooding their barn. 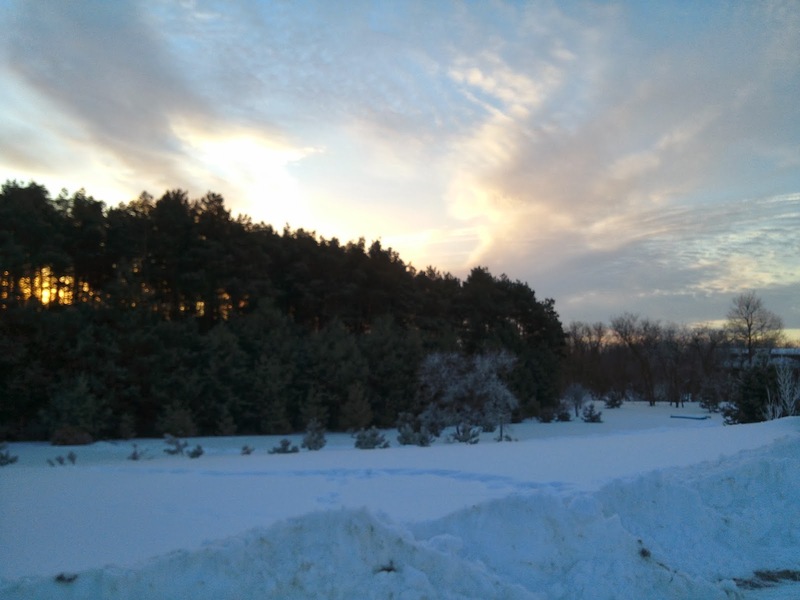 They are closer to the Lakes than us, but their pipe was 50" deep, and the frost line in our area is around 42". Our new greenhouse has survived the wild winter weather quite well. We had a huge wind and rain storm in the fall that unrolled the plastic from one of the roll-up sides, but besides that we have't had any issues! We planted a variety of cool-season vegetable crops in the fall in the greenhouse--arugula, lettuce heads, spinach, kale, Swiss chard, kohlrabi, radishes, turnips, and green onions. Most didn't make it past the first major snow storm in late November--when it started snowing before Thanksgiving and wouldn't stop. The spinach however is still alive in the greenhouse! After months without water and freezing temperatures, we got to enjoy fresh mid-winter spinach with a pesto chicken and mozzarella sandwich a few weeks ago. Just yesterday Farmer Figgins peeked in the greenhouse and saw the spinach crowns are still there and green! It's finally that time of year when we can start planting again! Night temperatures are still too cold in the greenhouse, so we've been starting seeds inside our house in a grow tent. In this little 4'x4'x9' tent we have 20+ flats of seeds started! As the night temperatures rise and the seedlings grow stronger they'll be transferred to the greenhouse to continue growing. At which time we will have to start setting peanut butter flavored mouse traps, a sad reality in any greenhouse. in a growing tent inside the house. 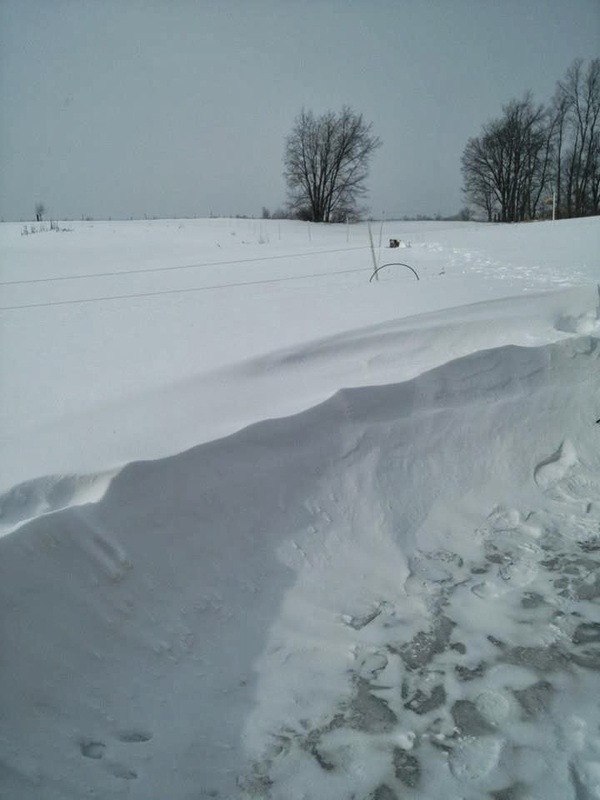 The chickens have been mostly coop-bound this winter, large drifts of snow have overwhelmed their pasture and fencing. Rather than let them out to wander on the snow drifts and risk a predator while their fence is out of commission, we've decided to keep them indoors and give them more space in the coop. Chickens confined in too small of a space and with little to do will often peck each other, we've noticed a few of the chickens have bare patches on their lower backs by their tails. We opened up the entire coop to them to give them extra space during the winter, as well we've been spraying Blue Kote on their bare backs to discourage pecking and treat the area. We keep their light on a timer so that it comes on early in the morning before sunrise and comes back on late at night around sunset. We do this to encourage them to continue to lay through the winter, since chicken's laying ability is dependent on the length of daylight hours they receive. As a result, we're still getting half a dozen to a dozen eggs a day! "Chickens are ‘told’ to produce eggs by their endocrine system, a system of different glands and organs that produce hormones. As the daylight hours shorten in winter, changes in these hormones shut down egg production. Adding additional light triggers the endocrine system into action, causing them to produce more eggs. Continuously giving chickens light in the winter fools their bodies into thinking that the days aren’t getting shorter at all." 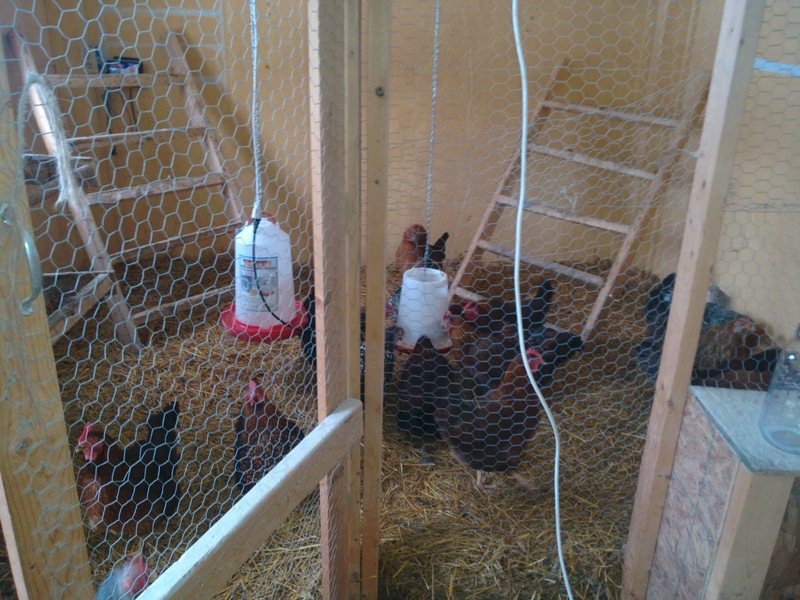 Another change for the winter we made was to purchase a heated water fountain for the chickens. We bought Farm Innovators' "All Seasons" 3 gallon heated plastic poultry fountain. It has worked well for the winter, we've had almost no problems with the water freezing up since we switched, but the handle is a little flimsy piece of plastic that makes up-righting the fountain after refilling a pain. Also, it does not hold up well to being filled and then carried some distance. The bottom does not close as tightly as most common waterers, and lots of movement can cause it to open. If you bring a bucket of water out to the coop and fill the fountain right there however, there are no problems. 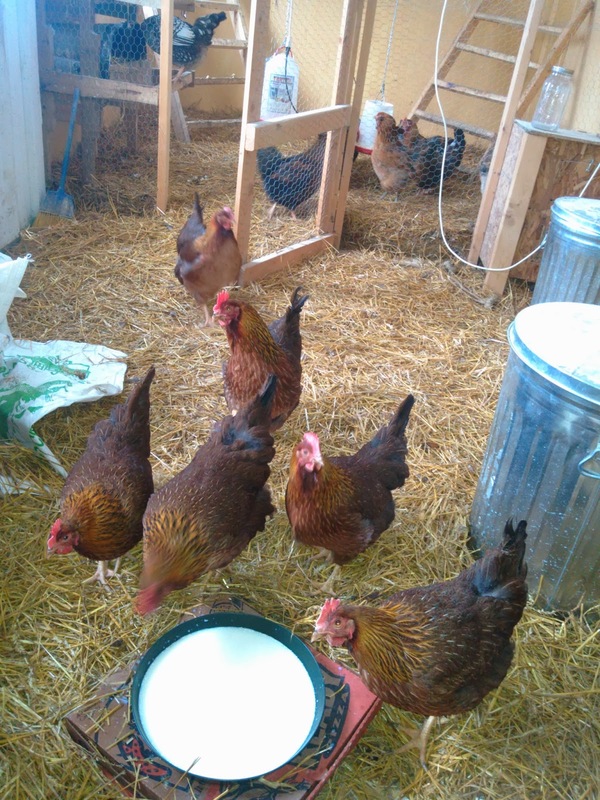 The chickens enjoying a winter snack--skim milk! We've also been giving the chickens some leftover skim milk from making cheese and dairy products. We have been giving this to Arya, but while she's away on vacation the chickens have been enjoying the snack! Even with the wild weather we've been having, we're glad to report that our "Farrowing E-Hut" we built for Arya has proven a great shelter for her this winter. During the worst parts of the winter we'd find her hidden under a pile of straw she'd somehow burrowed into, happily snoring away until breakfast time. After eating, she'd clamber back in and snuggle herself back into her nest of straw. 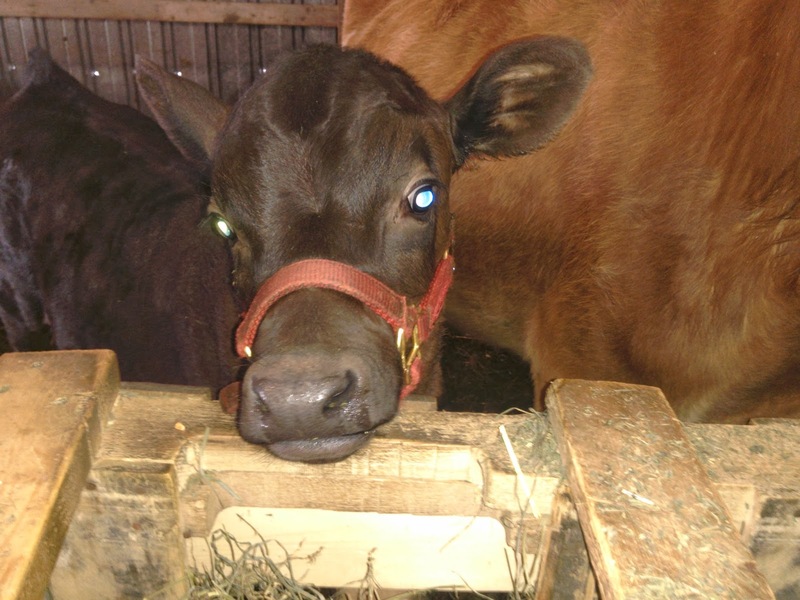 Though she's had a lonely winter by herself in the pasture, she is now on vacation at a friend's farm in Ionia, MI. 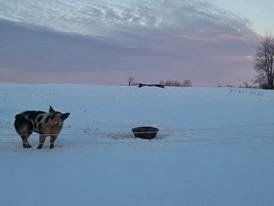 Farmer Figgins moved Arya all by herself, the hardest part was getting the ball into the hitch, while getting the pig in the trailer ended up being the easiest part! By offering her some warm scrambled eggs right off the stove and putting the bowl right under her nose, she followed the bowl and walked over the turned off and dropped down electric fence line and followed her nose up and into the livestock trailer. Farmer Figgins delivered Arya right as she was coming into standing heat. She spent the week with a dozen 4 month old pigs while periodically being moved to a separate stall with a Hampshire boar named Bud. Try as he might, Bud could not get any action with Arya and they spent their time fighting. Arya is currently out of heat, but she's staying on her vacation until she comes into heat again (usually every 18-24 days) and stands for the boar. A sow or gilt will show she is coming into heat when her back end becomes red and swollen, sometimes having a watery discharge. They become more vocal and restless, and will mount other pigs and sometimes be aggressive. Standing heat lasts from 1-3 days, generally shorter for gilts, and is when the mating or artificial insemination should occur for best results. There may be a sticky discharge, she'll be more vocal, have a poor appetite, act attracted to the handler, and most importantly stand rigid if mounted or pushed down on the back. By "attracted to the handler", we do not mean oh-la-la-la, bat-my-eyelashes attracted. We mean--a very excited pig nosing you hard in the thighs and legs, biting sleeves or pant legs or errant fingers until she is distracted by food. The easiest way to tell if a gilt or sow is in heat is to approach her from behind and press down on her back, where a boar would if he was mounting her. If she becomes rigid and stands still for this, she's in standing heat. Congratulations, now you know more than you ever wanted to know about pig reproduction! 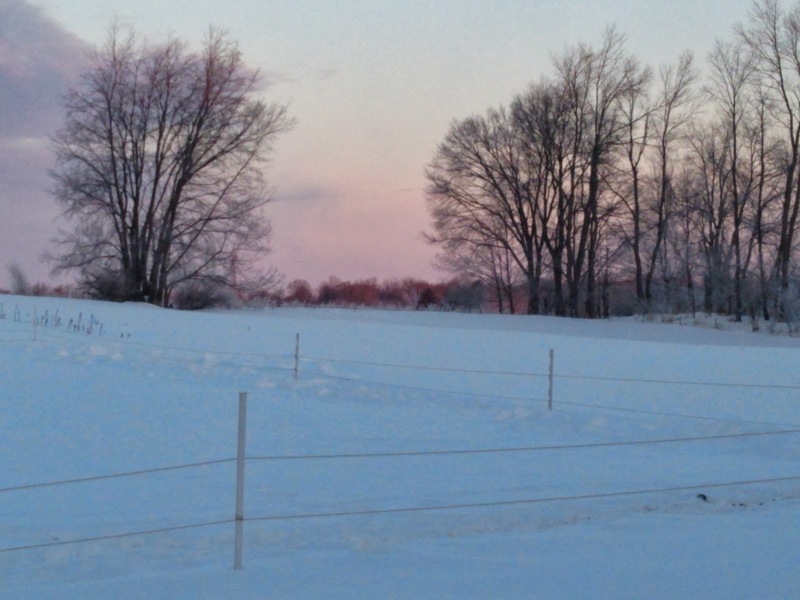 How has our electric fence system held up through the winter? We did end up having to switch to a regular electric fence charger this winter, we were not getting enough sunlight with the solar electric charger to charge the fence. Arya learned that quick and started going underneath the bottom line to another pasture to wait for her breakfasts some mornings. But once the charge was restored, she quickly stopped doing it. After the ice storms we did find that the electric fence wire became weighed down with the ice. An easy trick for de-icing these wires is to follow the pasture line with the wire inside one of the step-in post clips. Angle it just right and pull it along as you walk the fence line and it will knock all that ice off! The other thing is that at some point the snow will fall above your lowest fence line, and you will have to raise it. Or, you can shovel underneath the wire. If you have a small winter pasture area this isn't too much of a chore. But it is another winter chore you have to do. 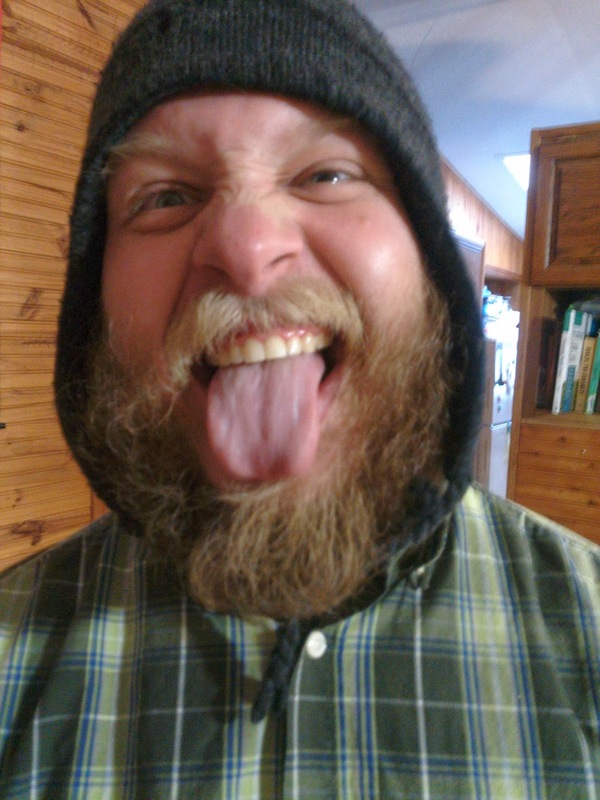 Welcome to winter! In regards to fencing, we'd like to move to a more permanent fencing system. 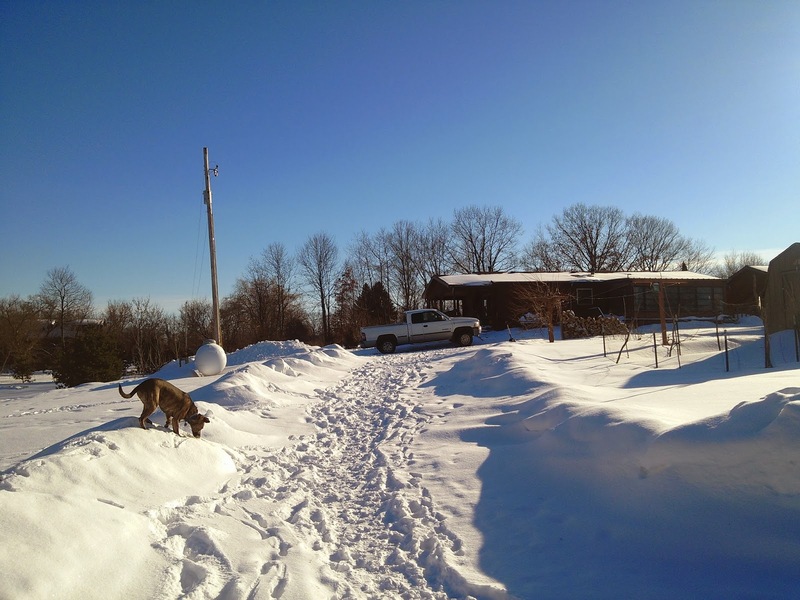 Bottom line, permanent fence posts offer stability and less maintenance in the winter, but step in posts and movable paddocks gives you flexibility to move and try new areas, but greater management issues--such as deicing, moving the lines, and shoveling snow that has piled too high. We've found that temporary, movable fencing is great to use while you are studying the land, getting to know it and how you are going to use it, and while you are deciding on what the best permanent pasture set-up could be. 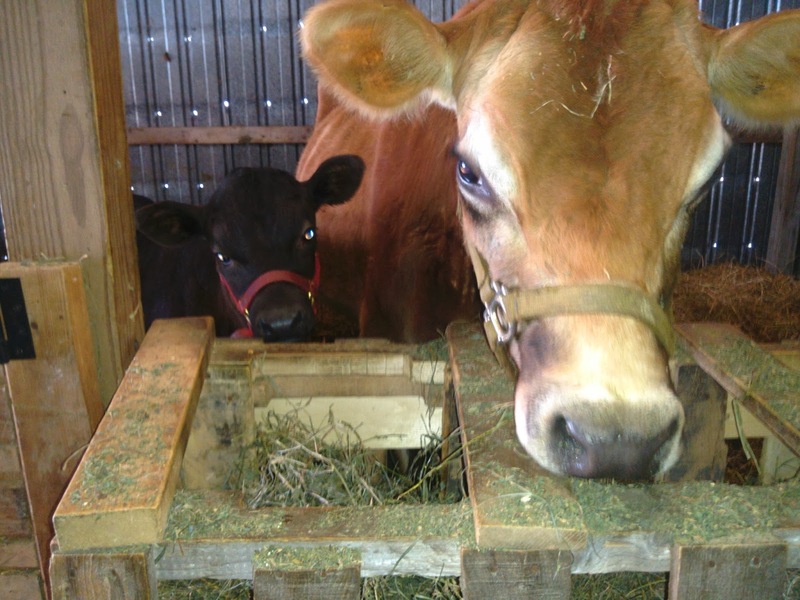 Pippin is starting to munch on hay when it's meal time for Rosie! In the barn the cows have been getting restless along with everyone else with the long winter. Pippin is almost 2 months old now, he's still loving the walking milk bar that he gets to spend his days with, but has started munching on a little bit of hay with Rosie at mealtimes. He's still not too interested in grain though. Soon we'll be castrating him. Pippin is almost two months old now, and he's almost outgrown his first halter! 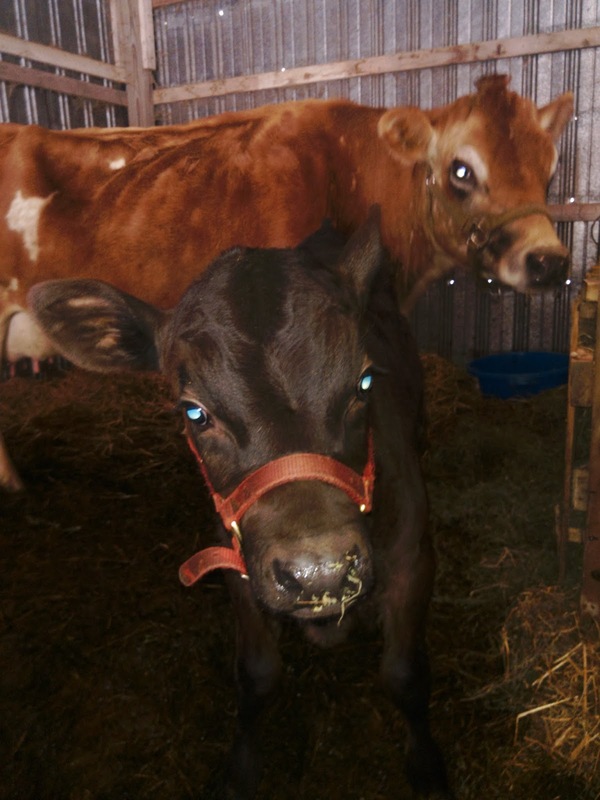 Pippin was a pretty shy calf when he was first born, hiding behind his mother and running circles around her to get away from us. But gradually, he has become less shy and will tolerate being petted, brushed, scratched and poked on the nose. Getting comfortable with a calf is about keeping a routine. For us, we go out to milk at 7:30 am while Pippin watches from the stall next door, then we move him back in the same stall with Rosie until they are separated at 7:30 pm. Multiple times throughout the day he is handled and interacted with, increasing his level of comfort and ease. In no time we'll be doing some castration! 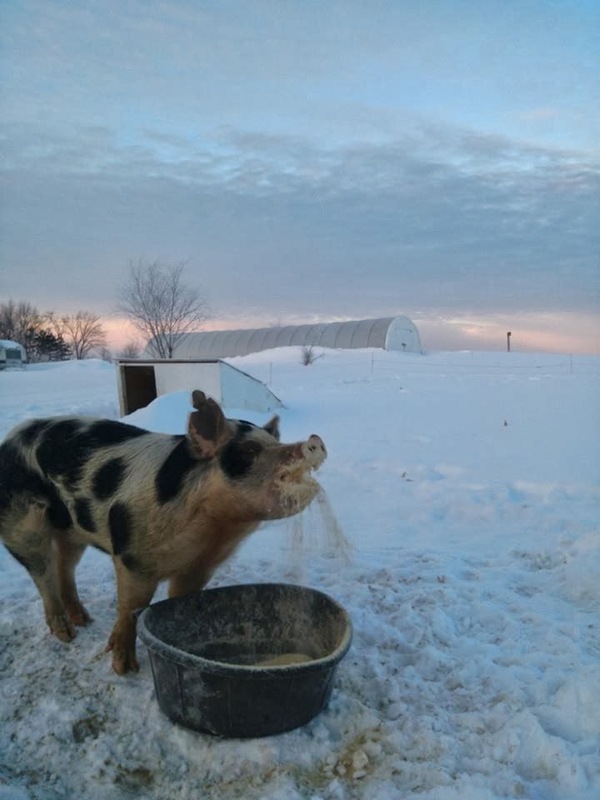 Besides providing us with milk and all the other dairy products we've been experimenting with, Rosie also preforms a very important task on the farm, and that is Compost Maker! 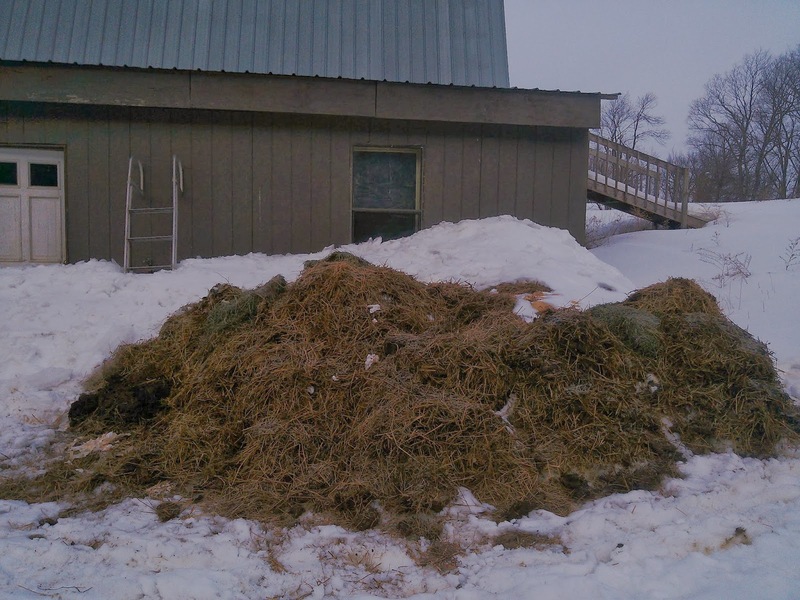 We started a new compost pile next to the barn and it is enormous! 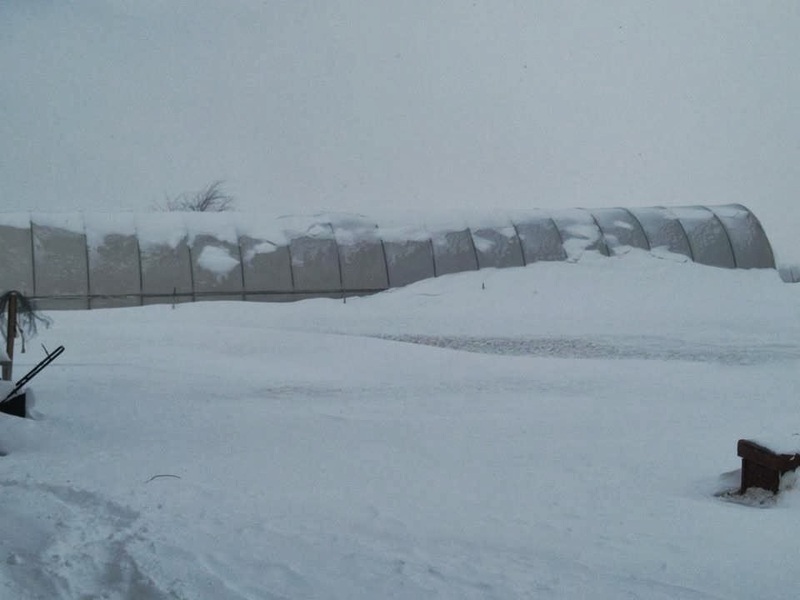 The pile of snow behind the pile is actually more compost, just covered in snow that fell off the barn roof. By next spring this will provide us with a lot of very fertile compost for the garden soil! The new compost pile which is half buried in snow all the way to the window.